The RH series centre hole cylinders are single acting, spring-return and range from 10-100T. 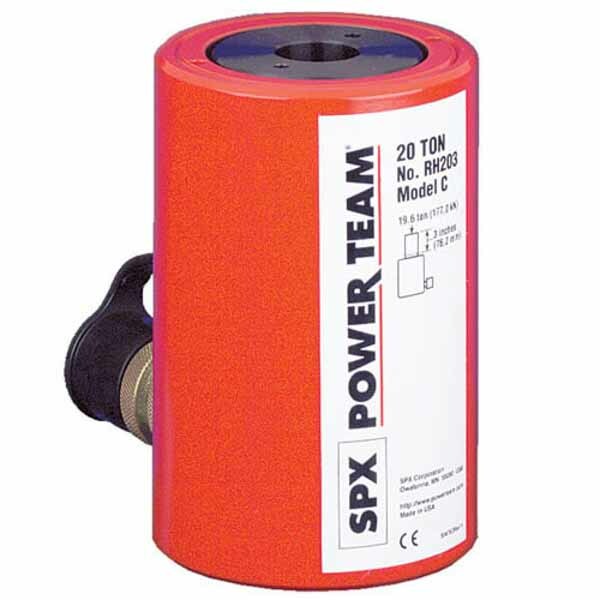 These centre hole cylinders are ideal for pulling and tensioning of cables, anchor bolts, forcing screws, etc. Wide variety of uses enabled by interchangeable piston head inserts. Threaded collar featured on 12, 20, 30, 50 and 60 ton cylinders (RH203 and RHA306 come without the collar thread). Lightweight RHA306 has an aluminium cylinder body and piston. “Dead end” loads are fully withstood. “Power Tech” treatment on standpipe prevents corrosion. Cylinders come with a 3/8” NPTF female half coupler (the RH120 excepted). ** RH120 and RH121T do not have an internal threaded insert, but do have a 3/4-16 internal thread. The RH120 inlet port is 1/4" NPTF.